← Get yer half wits out for the lads. 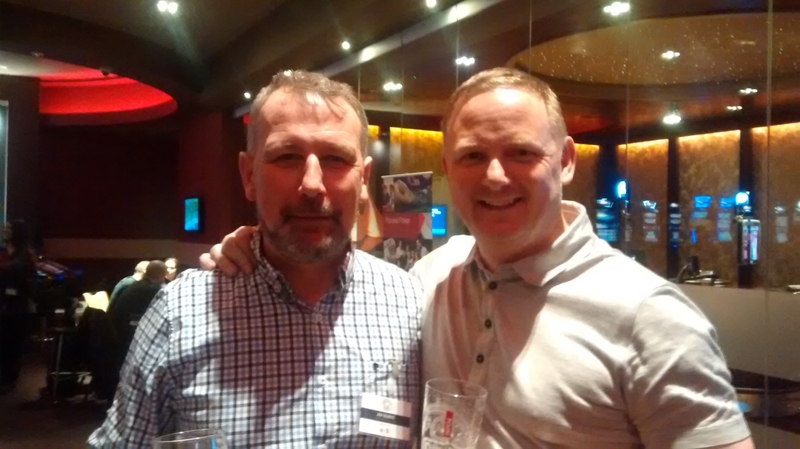 This time last week as a result of a very kind invitation from Iain Macintosh, Head Honcho and Chief Pot And Bottle Washer at The Set Pieces I pitched up for a night at the Grosvenor Didsbury Casino. The event was pulled together by Will O’Hara and before I go on I’d like to thank both of these guys for a great night out. The format for the evening was we were to arrive at the Casino for six thirty, mix with Iain, ex-United players David May, Clayton Blackmore and UWS Editor and all-round good egg , Andy Mitten then watch the game between United and Newcastle. Sounds decent enough, but throw in the big comfy sofas, excellent and regular table service from the FREE BAR then you can see that the chances of the night being anything less than a success were pretty slim. My use of a tactical holiday the day after proved a masterstroke worthy of Sir Alex Ferguson himself. Any of you who follow me on Twitter will know I have little love in my heart for the modern game at times and, if at all possible, even less for the average modern player. Their sense of entitlement, that air of “I can do anything I want” and detachment from the average fan that so many of them exude means I think I’d struggle to spend two minutes in a lift with them never mind two or three hours watching football with them. Let’s be frank, in terms of the greats that have played for United the names of May and Blackmore are unlikely to feature in the Best Ever 11 of many fans. However, like most players of that generation I have met their gratitude for having had the opportunity to play for a club like United was obvious. On arrival the two of them were talking about the previous United game, a truly uninspiring 2-0 home victory against Sunderland.They talked like what they are, two experienced professionals with an insight that comes with that CV. Then we started piping up with our half-arsed ideas and theories and then I saw something I don’t think you’d get in the modern-day footballer, interest and genuine engagement. The other guests were, clearly, proper United fans, very passionate about their team. They listened to every point, agreed when they could agree, disagreed and then explained why. I just couldn’t shake feeling that this sort of pro, conscious of the hand that the football Gods dealt them is a rarity these days. I won’t lie, a few pints got supped and both players were incredibly cheery company. Blackmore spent his formative years under the very watchful eye of Fergie and when he moved on to Boro he was a senior pro, a role model to his teammates so his tales, engaging and entertaining though they were centred around his playing career. David May on the other hand had six years at Blackburn Rovers where, under Dalglish the players had an off field freedom unthinkable under Sir Alex. In truth the effects of the free bar have affected my powers of recall but the tales of pre and post match hotel stays as a Blackburn player had me howling with laughter. Mike Newell crashing through a ceiling in a failed effort to surprise his teammates, the removal of the spy holes in hotel doors allowing a fire extinguisher to be discharged through the hole and Kevin Moran adopting the “battering you in your bed in the middle of the night” tactic should he find himself subject to any nonsense from one of the boys . This is the thing, in the course of the evening we got an idea of the wages they were on during their playing days. Don’t get me wrong, they were tidy but not of a level where they didn’t have to worry about working once their playing days were over. Nowadays a player can be financially secure for life by the time he reaches his 21st birthday. I don’t really grudge the players that money in some ways, clubs are getting fortunes from Sky so why shouldn’t the players be the main beneficiaries of the TV billions but I wonder at what cost in terms of relationship with the fans. I can’t shake the feeling that the disconnect caused by the wealth, the gulf between the average fan and player means that we are losing something. Many years ago I used to live near Joe McBride, a Celtic legend from the Lisbon Lions era, we used to walk our dogs together and I could have listened to his tales for hours. I suspect that in the years to come very few of the current Premier League “superstars” will find themselves in the company of the ordinary fans and engage with them so easily. These tales are part of the unwritten history of every club, players being so removed that they can’t pass them on is sad.